If any Raith fan was in any semblance of doubt that the team were locked in a battle with the teams bunched up behind them rather than with Arbroath, then this afternoon must have dispelled their last vesitige of hope, after Rovers dropped yet more points with a 1-1 draw with Forfar Athletic. The result leaves John McGlynn’s side just two points clear of East Fife who have played a game fewer, and three ahead of today’s opponents, and while there is an eight point gap between Raith and fifth placed Montrose, it’s considerably smaller than the one that exists between between first and second. Jamie Barjonas had fired Raith in front with a splendid effort in the first half, but John Baird’s late equaliser means Rovers have now squandered a remakable 20 points from winning positions this season. The Raith boss made three changes from last weekend’s 2-1 loss to Brechin, with Robbie Thomson making way for Dean Lyness who made his debut in goals. Kevin Nisbet replaced the injured Lewis Vaughan, while Nathan Flanagan dropped to the bench for debutante Barjonas. Forfar were the first to settle, forcing two corners in quick succession in the opening five minutes, but both were dealt with reasonably comfortably by the Rovers defence. The visitors should have taken the lead shortly thereafter though, when Iain Davidson lost out in a challenge to Dale Hilson, but with just the new Raith ‘keeper to beat, his shot lacked lustre and Lyness was able to gather easily. It took Rovers until the 12th minute to eke out their first dangerous looking opportunity, when Barjonas managed to drill the ball towards Nisbet from wide on the right, but the Rovers forward was just beaten to the ball by Loons custodian Marc McCallum. Dingwall was the next to threaten, pirouetting away from Murray McCormick in the middle of the park, before unleashing a shot from distance which he dragged well wide. Rovers fans had already had their first glimpse of what Lyness was capable from earlier in the match, but he pulled off a sensational stop in the 22nd minute, diving up and to his right to tip over an effort from Darren Whyte which had appeared destined to curve into the net. The game was something to an end-to-end encounter, and Rovers came close to taking the lead just before the half-hour mark, when good work from Gillespie down the right saw his cross find Murray on the edge of the area, but his half-volley was deflected over for a corner. The home side came even closer a moment later, when Duggan’s cross-come-shot from an acute angle was turned onto the crossbar from McCallum. While that would have been a good goal, the one that arrived shortly thereafter came squarely in the category marked spectacular. The impressive Dingwall was the architect, picking up possession and running at the Forfar rearguard, and while his tee-up to Barjonas left the 20-year-old with much to do, his shot from 25-yards flew into the net via touches from McCallum’s mitt and the inside of the post. The goal appeared to rock the visitors slightly, and while Raith failed to create too much in terms of clear cut chances between the goal and the interval, they did dominate possession, as Forfar were forced onto the back foot for the remainder of the half. The Raith players were out early for the second period, to perform a routine which was presumably a warm up, but also resembled an elaborately choreographed dance to Daft Punk’s Get Lucky which was emanating the PA system. Whatever it was, it seemed to work, at least initially as they almost made it two at the start of the second 45, when Nisbet drove at the heart of the Forfar defence, before pulling the ball back to Duggan, but his first-time effort was toed away by the impressive McCallum. Forfar had started the half poorly, and McGlynn’s men should really have doubled their advantage in the 51st minute, when Duggan’s fine cross from the right found Nisbet at the back post, but his downward header was nodded wide. Rovers fans had a slight heart-in-mouth moment in the 57th minute, when an innocuous looking pass-back from Gillespie suddenly looked concerning, when Lyness slipped as he ambled over to collect it, although he regained his composure to avoid what would have been a catastrophic concession from a Raith perspective. 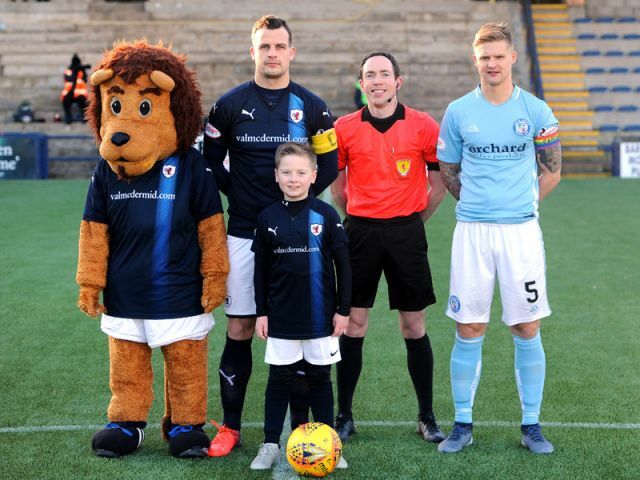 The incident had followed a period of the match where Raith had gone slightly off the boil in an attacking sense, with another Barjonas attempt from distance their only notable effort in what had become a lacklustre second-half performance. 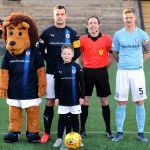 Forfar were now having the better of the game territorially, and McGlynn made his first swap in the 65th minute, when Nisbet was replaced by Liam Buchanan, as the manager attempted to reinvigorate a team which had grown a little weary looking. The game had been controversy free, but it exploded into a mild outbreak of handbags in the 78th minute. Dingwall appeared to think a player was in need of treatment so played the ball out, although at first glance, no-one looked to be injured. However, with the Rovers players angry that they weren’t given the ball back, Gillespie crunched into Dylan Easton, which led to a melee which ended with the two main protagonists, Gillespie and Easton in referee, Colin Steven’s notebook. With Rovers something of an expert in frittering away leads, there seemed something of an inevitability about Forfar’s equaliser, and it was the man who has scored so many against Rovers, John Baird who would grab it, smashing in a goal which while impressive, came after a terrible mix-up at the heart of the Rovers defence. There were only three minutes remaining, but Rovers still missed a gilt edged opportunity to grab the win, when Crane’s low cross from the left was somehow passed over by two Rovers players from just a yard out, with Murray seeming to stumble as he shaped to turn it home. It seemed a somewhat fitting final act to a performance which Raith fans have seen so many times this term. Welcome to Starks Park the sky is clear and it's 3 degrees. Rovers kick off towards the South Stand. Forfar with early pressure, Rovers defending 2 corners finally get the ball up the park. Davidson beaten to the ball by Hilson whose low shot is smothered by Lyness. Crane with a free kick from 35 yards fires straight to the keeper. Dingwall then Nisbet trying to find a way through the visitors defence. Rovers survive another brace of corners. McCallum diving at the feet of Nisbet, corner. A high ball in from Crane is gathered by McCallum. Wedderburn with a low strike sees the ball rebound of a defender. Dingwall with some individual play beats his marker but sends his low shot wide of goal. Shouts for a penalty as Crane appeared to be bundled of the ball at the back post. Wedderburn blocked, Mr Steven waves on play, then chats to an annoyed Rovers gaffer. Nisbet running clear but is miles offside. A spectacular save by Lyness, tipping the ball over from a dipping strike by Whyte. Reilly goes without sanction after a two footed tackle on Wedderburn. Latest score. Raith Rovers 0-0 Forfar Athletic. Murray hits a peach but seeshis shot blocked by Travis. Dingwall slips into the box, his shot rebounded of the chest of McCallum. Duggan sees his shot/cross come of the crossbar. Dingwall lays the ball into the path of Jamie Barjonas whose strike from 25 yards bursts the net. Murray could have doubled the leadd if he was wearing his dancing shoes. Half time. Raith Rovers 1-0 Forfar Athletic. Both teams with pressure and possesion. Definig moments, Lyness with the save and the goal from Barjonas. Nisbet beats two men, crosses to Duggan whose shot goes out for a corner. A free kick from wide left is headed wide by Murray. Murray and Duggan interact, the latter sees his cross headed wide by Nisbet. Barjonas yellow for a foul. Rovers a wee bit light with the passes at the moment, a few moves breaking down and lost possession. Latest score. Raith Rovers 1-0 Forfar Athletic. Barjonas forcing a low save from McCallum. Easton takes a pitching wedge to the ball from 25 yards, it ends up in the South Stand. Buchanan making an instant impact, drills the ball in from the right but Barjonas couldn't pull the trigger. Dingwall shoots wide from the edge of the area. MacIntosh off, Trialist (Gary Irvine ) on. Crane and Buchanan 1-2 the latter fires across goal. Third and final substitution by Forfar, Hilson off, Moore on. A terrific run into the box by Buchanan, gets the cross in but there's no one there to claim the ball. Gillespie and Easton yellows for a coming together. Lyness gathered a dangerous cross from Meec. John Baird picked up a loose ball and fired high into the net from the edge of the box. How did that not go in? Euan Murray looked to have sat on the ball on the goal line the the ball was cleared. +1 Matthews yellow for dissent. +3 Full time. Raith Rovers 1-1 Forfar Athletic Barjonas 33' - Baird 86' Attendance 1406, 103 visiting supporters. Lyness, Crane, Davidson, Murray, Benedictus, Duggan, Gillespie, Dingwall, Wedderburn, Nisbet, Barjonas. Subs, Thomson, Buchanan, Matthews, Flanagan, McKay, Watson, McGuffie. McCallum, Meechan, Eckersley, Whyte, Travis, Reilly, Hilson, Bain, Baird, Coupe, MacIntosh. Subs, Easton, Moore, Malone, Trialist, Aitken, Hoban. Raith Rovers will be hoping for the return of home comforts this weekend, when they entertain Forfar Athletic at Stark’s Park. After last weekend’s 2-1 loss at Brechin City, Rovers remain 13 points behind Arbroath, but with East Fife and Saturday’s opponents in close pursuit, John McGlynn’s men face a battle to hold onto their current position in the League One table. The Loons have been in excellent form in recent weeks, with four wins from their last five league games, and last Saturday’s impressive 2-0 win over Arbroath means they now sit just three points behind Rovers in the table. Ex Raith player, John Baird has been doing a fine job of leading the line, with 11 goals to his credit this season, while Dale Hilson has also chipped in with seven. At the back, Marc McCallum has continued to prove he’s one of the best goalkeeper’s in the lower leagues, while an already impressive defence has been augmented by the signing of former Hibs, Hearts and St Mirren defender, Adam Eckersley. The Loons can boast a good looking midfield too, with Thomas Reilly enjoying an excellent season in the middle of the park, while Dylan Easton has long been considered one of the most technically gifted players in the part-time game. The teams have one win apiece this season in the head-to-head, with both games producing plenty of goals. Rovers got all of them in August, with a comprehensive 4-0 thumping, thanks to goals from Kevin Nisbet, Chris Duggan and a brace from Lewis Vaughan, but it was a different story at Station Park in October, where goals from Ross Matthews and Nisbet fired Rovers into a 2-1 lead, only for Forfar to come from behind to post a 3-2 win. Rovers hold the upper-hand over the most recent meetings, with six wins and one draw from the last ten encounters.